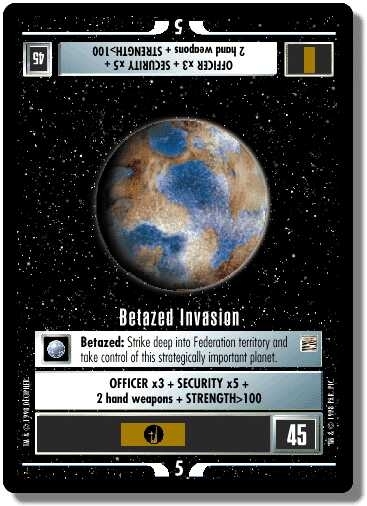 Betazed: Strike deep into Federation territory and take control of this strategically important planet. Mission located in Alpha-Quadrant with span: 5 and points: 45. There are 37 entries for Betazed Invasion (ST1E 6 R 46) at the Tradeplace (45 haves and 14 wants). Click here to see all trade list entries for this Rare card! Also see here for all trade lists with any card fom "The Dominion".